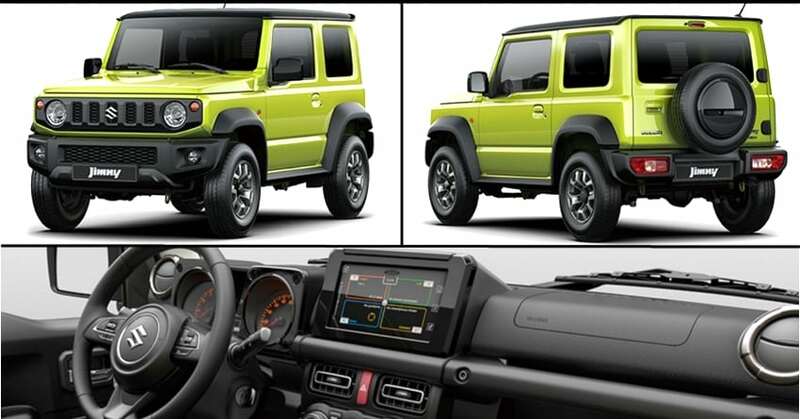 New Suzuki Jimny Officially Revealed: 2019 Jimny compact SUV has been unveiled by Suzuki in a set of official photos. It will be available in 2 variants: Suzuki Jimny and Suzuki Jimny Sierra. Judging from the official pictures we recently came across, the compact SUV doesn’t disappoint. The images guarantees the mini-off roader to be much impressive with power packed performance. The company is essentially targeting the young audience with their vibrant double-tone color scheme with a black roof. 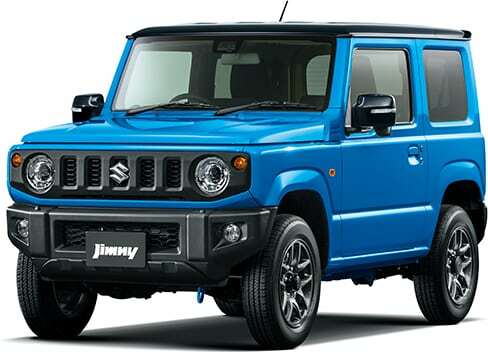 2019 Suzuki Jimny will be available in Brisk Blue Metallic and Fluorescent Yellow colors with a black roof and Chiffon Ivory Metallic, Medium Gray, Bluish Black Pearl, Blueberry Purple Metallic, Silky Silver Metallic, Pure White Pearl and Superia White single color tones. One of the major difference Jimny gets from Jimny Sierra is the contrast roof and a black plastic body cladding surrounding the wheels and squared arches. In comparison to the last-gen model, the 2019 Jimny gets larger tyres, a vertical grille, round-shaped projector headlamps, distinct front bumper with prominent wide air intake, flattened bonnet and much more. Similarly, the interiors are tweaked with several major features to give it a premium overall feel. 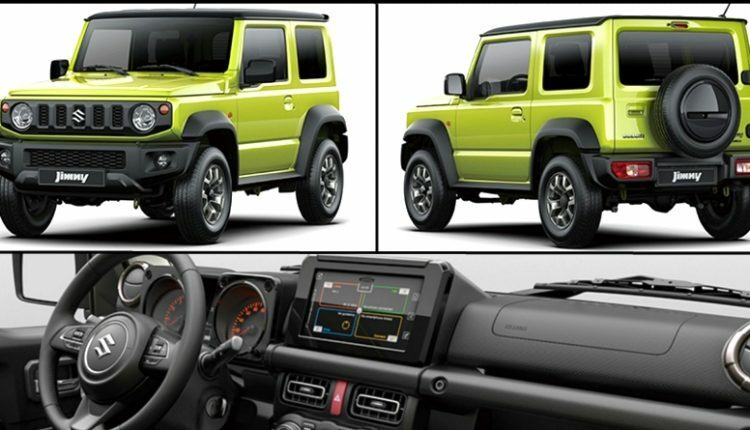 New Suzuki Jimny gets a touchscreen infotainment system with with Apple CarPlay and Android Auto, control straddled steering wheel, new seat upholstery, square AC vents, airbags for safety and much more. 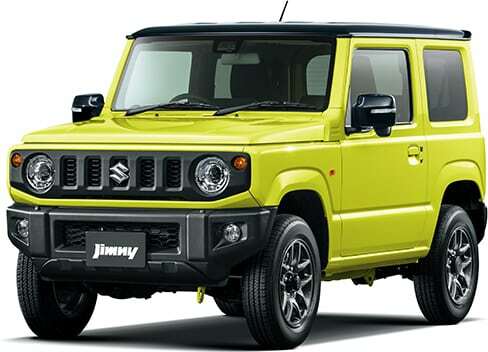 New Jimny is available in two engine options: 660cc, petrol engine mated to a 5-speed manual or 4-speed automatic gearbox, 2nd engine is a 1500cc petrol engine with same transmission options. 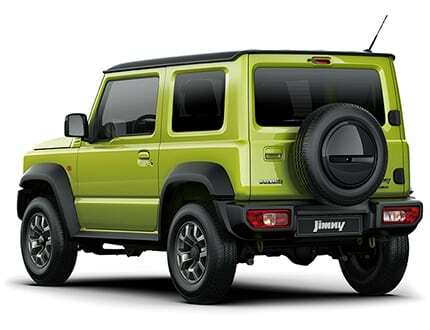 Jimny is equipped with 660cc engine and Jimny Sierra comes with 1500cc engine. Sierra model also comes with 4WD as standard. Judging from its muscular stance and the powerful engine for off-roading, it is going to grab a worthy attention on the road. Suzuki Jimny will most probably replace the aging Gypsy in the Indian market. It will go on-sale in Japan next month, while India launch is expected to happen in 2019.